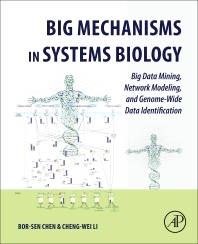 Big Mechanisms in Systems Biology: Big Data Mining, Network Modeling, and Genome-Wide Data Identification explains big mechanisms of systems biology by system identification and big data mining methods using models of biological systems. Systems biology is currently undergoing revolutionary changes in response to the integration of powerful technologies. Faced with a large volume of available literature, complicated mechanisms, small prior knowledge, few classes on the topics, and causal and mechanistic language, this is an ideal resource. This book addresses system immunity, regulation, infection, aging, evolution, and carcinogenesis, which are complicated biological systems with inconsistent findings in existing resources. These inconsistencies may reflect the underlying biology time-varying systems and signal transduction events that are often context-dependent, which raises a significant problem for mechanistic modeling since it is not clear which genes/proteins to include in models or experimental measurements. The book is a valuable resource for bioinformaticians and members of several areas of the biomedical field who are interested in an in-depth understanding on how to process and apply great amounts of biological data to improve research. Bor-Sen Chen is currently the Tsing Hua University distinguished chair professor. He received his PhD degree in Electrical Engineering from University of Southern California in 1982. He is major at system control, signal processing and communication system. He also published about 200 SCI journal papers in two fields. He has been elected as an IEEE fellow in 2001 and became a life fellow of IEEE in 2014. In the last decade, he has published more than 70 journal papers in systems biology and bioinformatics after he had audited more than 10 courses in biology from 2010 to 2013. He has also published three books, including Synthetic Gene Network: Modelling, Analysis and Robust Design Method (CRC Press, 2014), Systems Biology: An Integrated Platform for Bioinformatics, Synthetic Biology and Systems Metabolic Engineering (NOVA Science Publisher, 2014), and H Robust Design and Its Application to Control, Signal Processing, Communication, Systems and Synthetic Biology (NOVA Science Publisher, 2015). Professor Chen has been a member of Editorial Board of several international journals, including BMC Systems Biology (2010-2015). Cheng-Wei Li received the B.S. degree in automatic control engineering from Feng Chia University and the Ph.D. degree in electrical engineering from the National Tsing Hua University (NTHU), Hsinchu, Taiwan, in 2003 and 2010, respectively. He currently joins Dr. Bor-Sen Chen's lab at NTHU (2011-now) to conduct postdoctoral research in systems biology, and computational neuroscience. His research interests include systems biology, bioinformatics and stochastic nonlinear control.